The Louisiana Thoroughbred Breeders Association evolved from a small group of horsemen who united in 1963 when only 142 Thoroughbred foals were registered in the state. Under the leadershipof Andrew L. "Red" Erwin and State Senator B. B. Rayburn, this group was successful in having legislation passed that created an incentive to breed Thoroughbreds in the state. Since that time, the Thoroughbred industry in Louisiana has grown to become one of the state's top industries. 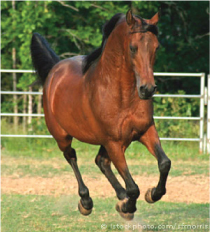 Through the efforts of the LTBA and the implementation of the breeding incentive program, Louisiana-breds have flourished. Foal production in the state has climbed, reaching an apex in 1984 of nearly 2500 foals. However, just as other states have experienced the economic ups and downs of the racing and breeding industry brought about in the 1980's, Louisiana, as well, saw a drop in foal production with 1246 foals registered in 1994. Since then the foal crop has been on a steady incline that will see more than 2500 foals born in Louisiana in 2008. Increased purses at the state's racetracks and an increase in better quality horses have resulted in higher prices for horses and have given rise to increased interest in racing and breeding horses in Louisiana. In 1991, the LTBA in conjunction with the state's Quarter Horse breeders launched Louisiana Champions Day at Fair Grounds. As an 11-race showcase for the state's best Thoroughbreds and Quarter Horses, the event attracts local and regional attention as well as national attention from over 200 out-of-state simulcast locales. We have now added state bred days at every track in the state. Delta Downs has Louisiana Premier Night in February, Evangeline Downs features Louisiana Legends Night in conjunction with the July 4th weekend and Louisiana Downs conducts Louisiana Cup Day in August. All of these days are restricted to accedited Louisiana bred horses and offer a full card of stakes races. Louisiana's racing and breeding industry plays an important role in the state's economic well-being and contributes a significant source of state revenue. The combined impacts of both racing and breeding and their related industries generates over $1 billion annually and employs nearly 13,000 people.